I received two bottles of Laguna wine. I have yet to open the Il Gruccione. I am looking forward to it and will share those results with you very soon. I did open up the bottle of Cantine Lenotti and will be sharing my thoughts with you today. I was completely unaware of Laguna wines prior to this tasting. Susannah also sent along a lot of information about this area and the wines it offers. I will be sharing some of that information with you today. You can learn more by joining us for twitter chat today at 11 AM ET following #ItalianFWT. This chat and this month's posting is being hosted by Gwendolyn of Wine Predator. You will also get a lot of information from her invitation post. Lake Garda is the largest in Italy. The wine making in this area dates back to the Roman Empire. 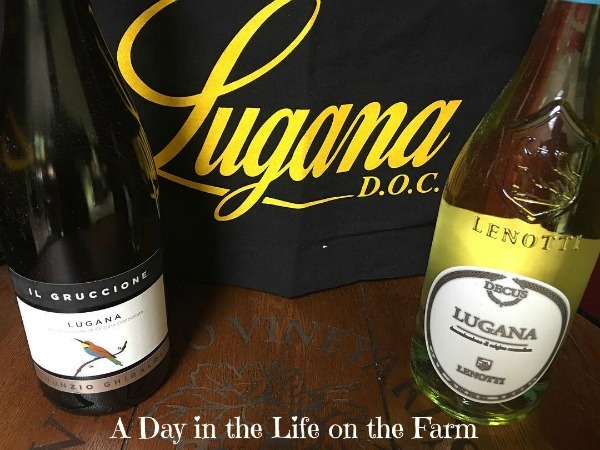 Lugana wines are made with Turbiana grapes. These grapes produce a white wine that is full bodied, with floral and citrus notes. The Lenotti Lugana poured a light golden yellow. The initial sip was very floral leaving behind some citrus notes. It is a full bodied wine that left a comforting heavy feel in your mouth. As a food pairing, I cooked up a creamy Wild Mushroom Risotto and topped it with some Pan Seared Shrimp. I served some glazed carrots and fresh tomato slices on the side. The pairing was very good. 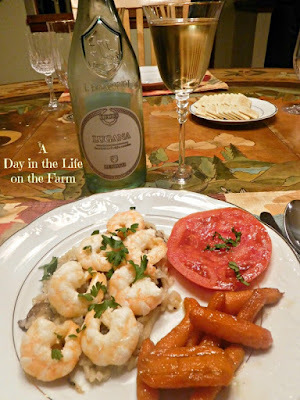 My husband especially liked how the wine paired with the sweetness of the carrots. Before I share my recipe for Wild Mushroom Risotto with you, let's take a look at what the others thought of their samples from Laguna. Marcia at Joy of Wine: Lugana is "Not just Another Italian Grape"
Jane at Always Ravenous: "Crab Herb Crusted Chilean Sea Bass and Lugana Wine"
Camilla from Culinary Adventures With Camilla: "Turbiana Grapes and Tuna Tacos"
Jill at L’Occasion :"Lugana: An Italian White Wine For All Seasons"
Katarina at Grapevine Adventures: "3 Lugana DOC Producers in Comparison at #italianfwt"
Lisa at The Wine Chef: "Seafood Pasta With Tomatoes, Garlic And Lugana White Wine"
Li of The Wining Hour: "Lugana Loves Lake Garda"
Rupal the Syrah Queen: "A Journey to Lugana - Italy’s Elegant White Wines." Lynn at Savor the Harvest: "Change It Up With Lugana DOC and Turbiana"
Susannah at Avvinare: "Lugana Love"
Nicole at Somm's Table with "One Afternoon in Lugana at Podere Selva Capuzza"
Plump, delicious pan seared shrimp top a tender cream rice flavored with white wine and studded with wild mushrooms. Place chicken stock in a small pan and bring to a simmer on the back burner of your stove. Melt 2 Tablespoons of the butter with 2 Tablespoons of the oil in a large skillet over med high heat on the burner in front of the one holding the broth. Add the onions and mushrooms. Cook, stirring occasionally until onions are translucent and mushrooms begin to shrink, about 3-4 minutes. Add the rice, cook and stir, until rice is translucent and starting to toast a bit. Pour in the wine and stir until all liquid is absorbed or evaporated, another 3-4 minutes. Add a ladle of the broth, cook and stir until absorbed. Continue adding ladles of broth, cooking and stirring, until the rice is tender with a creamy sauce. You may have broth leftover. If you run out of broth before the rice is tender, add a ladle of hot water to finish cooking. The entire process should take about 30-40 minutes. 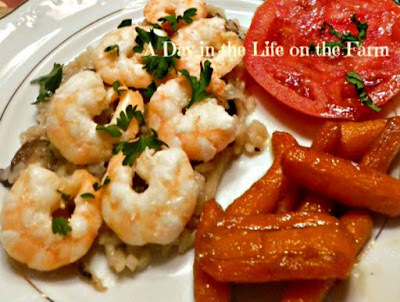 Remove from heat, season to taste with salt and pepper and set aside while searing the shrimp. Melt the remaining Tablespoon of butter with the remaining Tablespoon of oil in a large skillet over high heat. Season the shrimp with salt and pepper. Lay in a single layer in the skillet and cook for a minute or two on each side until bright pink. This can be done in batches. To serve place one quarter of the risotto onto each of four plates and top with one fourth of the seared shrimp. Now I'm craving shrimp and it's 6 in the morning here. LOL. Thanks. I can't wait to try this, Wendy. I love anything with shrimp and seafood! I will definitely try your recipe Wendy and pair it with some Lugana! Yum! Sounds like a wonderful pairing particularly with a Lugana with some age on it! It was a good pairing Gwendolyn. 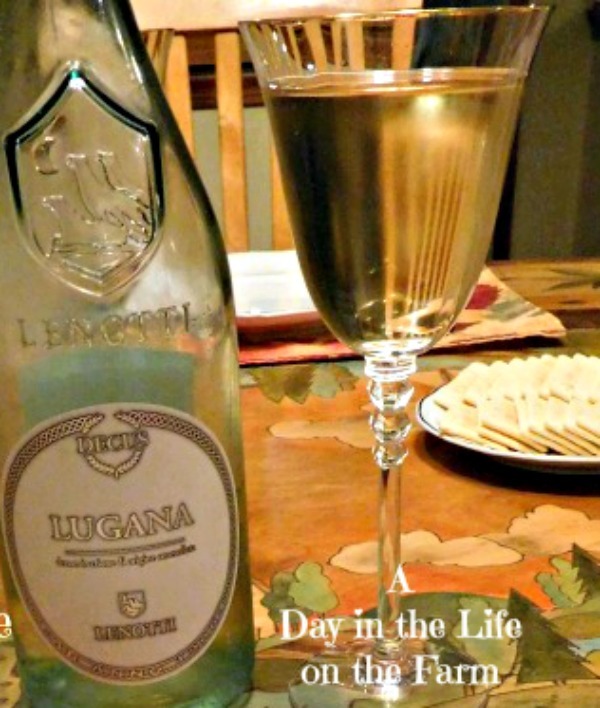 Seafood makes for a great pairing with Lugana. It was my introduction to Lugana and am now a fan. I think finding it in stores may be more difficult, however, I think the Lugana trend is building and will soon be more available in the US. Seafood is such a great pairing with these wines and who doesn't love some risotto?! Looks wonderful.